Properties in French Polynesia average 4.5 out of 5 stars. Property 3: Bungalow-Studio beachfront "La Frégate"
Beautiful 2 br home on famous Matira Beach! Property 18: Beautiful 2 br home on famous Matira Beach! Let You Get Away From It All. Your Heaven On Earth On A Small Private Island. Property 27: Let You Get Away From It All. Your Heaven On Earth On A Small Private Island. 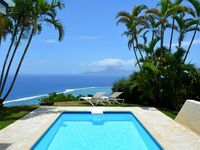 Property 29: The Green Room Villa: Teahupo'O, Tahiti Vacation Rental. Deluxe Home in Gated Residence. Spectacular Panoramic Views. Access to Beach. Property 38: Deluxe Home in Gated Residence. Spectacular Panoramic Views. Access to Beach. Property 44: Bungalow one - Brando's World Famous Over Water Bungalow in Bora Bora! Property 49: The Black Pearl! The most luxurious private Over Water Bungalow in Bora Bora! Excellent house - absolutely amazing view and very convenient overall. Excellent service - Mike was great in showing us everything / helping us out when we arrived.